Black shiny armor (sorta like how Vader's armor is shiny) and a black jumpsuit under it. This would be complemented with silver & royal highlights....yesssssss that would be it! Was that like a megatron yes? Anyway. Mine would be a deep green as the breast plate. And red other armor. For lack of a better word. And I would have a bit more armor. As per the Neo-crusaders. There are quite a few different colour variations to Mandalorian armour which do you think looks the best and why? I love Boba's, mainly because it's the original and that's what I expect to see. Same as boba, minus the jetpack but with some different trophies, and a red/grey/black scheme. he's got a saber too? nice. Is he force sensitive? yeah. Help always....helps. 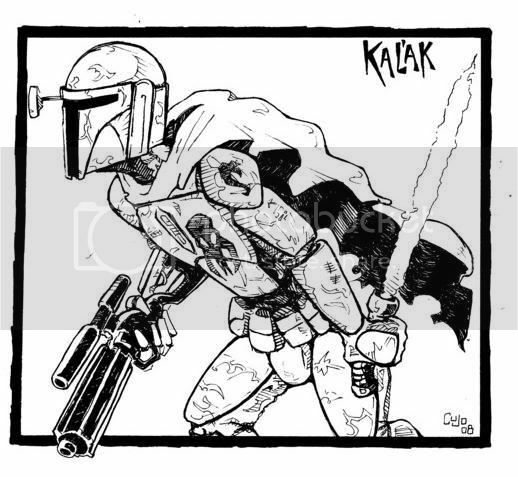 Now, Kad'ika, if trained, would have an easier time of it. or all of the Omega and Delta. nice. and cloned limbs don't always last, as Boba found out. I'm surprised that there was a Jedi, and a Boba Fett site. Are there many, or mostly mandos? Of course there is a Boba Fett fan site. I think we all agree Boba is the best Star Wars character ever? welllllll......Kal Skirata might be better. But hes VERY high up. best bounty hunter, without a doubt. very.....my fault. Yeah, I'd go with gold--vengeance sounds cool to me. Does anyone know what the colors mean? And green is for duty I think. To answer Ralin Drakus' question: Gold stands for Vengance and Green for Duty. it was? I don't remember them describing Munin Skirata's armor....must have missed it. He gave the gold to Kal though.